"Cocoa and chocolate chips bring lots of chocolate to this creamy, delicious cheesecake." Heat oven to 300 degrees F. Spray bottom of 9-inch springform pan with no-stick cooking spray. Combine graham cracker crumbs, sugar and butter; sprinkle evenly into bottom of pan. Beat cream cheese until fluffy in large bowl. Mix in cocoa and flour. Add remaining ingredients; mix well. Pour into prepared pan. Bake 40 to 50 minutes or until center is set. Cool. Chill. Garnish as desired. See how to make these delicious, decadent sweet treats. 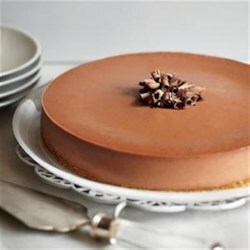 This is the best chocolate cheesecake recipe ever. It was creamy and everyone loved it. No changes for high altitude needed. I followed this recipe exactly. It turned out very creamy and had a nice cheesecake flavor, but double chocolate it is not. If you want a true chocolate cheesecake look elsewhere. It ended up with good flavor and was very easy to make. My batter was very lumpy because I didn't soften my cream cheese so I used an immersion blender to smooth it out. OMG Awesome! I made this with non fat cream cheese and non fat condensed milk. Baked in a chocolate cookie 12" crust. So rich and creamy smooth. This is a keeper and will make again!